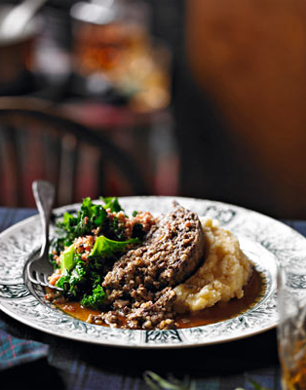 Celebrate Burn’s Night in style with this traditional haggis recipe. Serve up with smokey whisky gravy and the obligatory neeps and tatties. Scotland celebrates poet Robert Burns tonight with a traditional dish of haggis, neeps and tatties. Why not serve yourself this tasty winter warmer up at home, accompanied with a wee dram of whisky, naturally. 1. Preheat the oven to 180ºC, gas mark 4. Cook the haggis according to pack instructions. 2. Meanwhile, melt the butter in a large frying pan over a high heat. Add the onion then reduce the heat to low and cook for 15 minutes, stirring frequently until dark brown. 3. Increase the heat to high and add the whisky. Leave to bubble vigorously, stirring frequently, for 3-5 minutes until almost all has evaporated. 4. Add the stock and redcurrant jelly to the pan, bring to the boil, then leave to simmer vigorously for 30 minutes or until at least two-thirds its original volume, and the sauce is thick and glossy. Strain the gravy through a sieve. Serve the haggis at the table with the gravy alongside. Having a Burn’s Night party this January 25th? Serve up a haggis alternative with these decadent and delicious haggis scotch eggs.